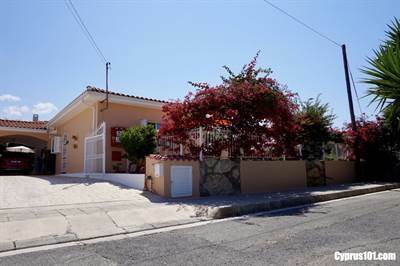 • 100 sqm , 2 bath , 2 bdrm bungalow – FOR SALE €199,995 EUR . This beautifully presented 2 bedroom, 2 bathroom bungalow in Emba is situated in an established residential area, within easy walking distance to the village. Being nicely tucked away at the end of the street, facing a rural aspect with horizon sea views, the location is particularly quiet and peaceful. The property is maintained to a high standard by the current owners and is in excellent condition with good quality finishes. The accommodation is spacious throughout and features a light open plan living room with comfortable lounge, formal dining area and modern kitchen with breakfast bar. The kitchen is well equipped with white fitted units and black granite worktops. Appliances include built-in oven, electric hob, extractor fan and fridge/freezer. An archway leads to a hallway where the washing machine with useful linen cupboard above is situated. Off the hallway is the master bedroom with fitted wardrobes and en-suite shower room, a second double bedroom with fitted wardrobes and a separate family size bathroom. From the living room and bedrooms, sliding patio doors provide easy access to the very private outdoor leisure space, which features a tiled swimming pool, sunbathing terrace, seating area and gazebo. The low maintenance gardens are beautifully landscaped and to the rear of the property is an orchard of fruit trees, including mandarin, grapefruit, lemon and oranges. To the side is a gated driveway with car port to the rear which can easily be converted into a full garage if required. There is easily space for parking three vehicles. This property certainly had lots to offer and is perfect as both a permanent residence or holiday home. It comes fully furnished and has title deeds.